Having ready access to hot water is something that most Americans take for granted every single day. Just like other modern luxuries like cell phones and internet access, we don’t tend to spare much thought about how water heaters function until they stop working properly and throw a great big monkey wrench into our daily routines. Nobody likes to start the day with a cold shower, but the impact of a faulty water heater can go far beyond inconvenience, especially for people who live with below-freezing temperatures for part of the year. 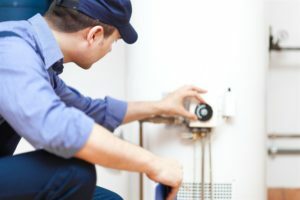 In keeping with Murphy’s Law, things tend to break at the time of least possible convenience; that’s why it’s important to be proactive about water heater maintenance and upkeep throughout the year and to have an experienced plumbing company that provides emergency repair services on speed dial just in case. 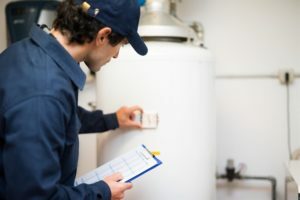 Here, we’ll examine some simple ways to extend the life of your water heater and at what point you should reach out to the pros for assistance. Water heaters, like many appliances, are simple in concept but a little more complex in applied practice. At their most basic, water heaters are insulated holding tanks designed to make sure your home has enough hot water on hand when called upon. Throughout the course of their lives, water heater tanks will tend to accumulate sediment—a compacted layer of dirt and particulate brought in from your home’s outside water source—which can potentially cut down on the efficiency and lifespan of your water heater. Cut power to the water heater, either by turning off the breaker for electric heaters or setting to “pilot” for gas heaters. Turn the water heater inlet valve to the “off” position in order to prevent refilling during the drain. Attach a length of hose to the drain valve, which will be near the bottom of the tank—most garden hoses will do fine for this procedure. Place the hose’s other end somewhere it can drain safely, like a floor drain or the gutter. Open a hot water tap near the water heater, ideally on the floor above, to allow for quicker and more efficient draining; think of it like taking your finger off the top of a straw filled with liquid. Open the drain valve and allow gravity to do its work. Even if the drained water appears totally clear of sediment, there may still be a layer on the bottom of the tank. Repeat the previous step until drainage runoff appears sediment-free. Close the drain valve and allow the tank to refill before turning the water heater back on. Some tanks need to be totally full in order to avoid damaging the heating element, so it’s important to familiarize yourself with your specific heater’s manufacturer di­­­­rections and warnings before draining. Doing a simple flush routine from time to time will not only keep your water heater running efficiently, it will also prolong its life by helping avoid rust and corrosion on the inside of the tank. It’ll also help your water heater run less conspicuously, as sediment can occasionally form into a ball-like shape and make a lot of harmless but annoying noise banging around inside the tank. 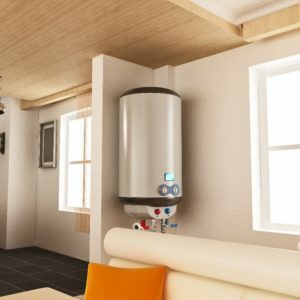 Have you ever really thought about how and why water heaters work for as long as they do? They’re made of metal, after all, and it’s a known fact that metal rusts when exposed to water for any prolonged amount of time. Logically, one would assume that having a big metal tank which is constantly full of water in one’s home would be a recipe for rusted-out disaster; fortunately, thanks to a tricky bit of simple science, we’ve figured out a way to “distract” the corrosion from setting in and doing its dirty work on the tank itself. It may sound like something from a rejected Star Trek script, but every water heater relies on a sacrificial anode in order to function properly and avoid rust. The sacrificial anode is a long rod which is usually screwed into the top of a water heater. It’s usually made of magnesium or aluminum, both of which corrode at a much more rapid rate than the steel which makes up most of the water heater tank. This means that the anode will attract any corrosive elements, purposely taking on as much rust and corrosion as possible in order to spare the tank and prolong its life. Depending on a variety of factors such as the chemistry of your water source and how hot you run your heater, some anodes may need replacement more often than others. It’s recommended that homeowners check on their sacrificial anodes at least once every two years to make sure they’re doing their job and keeping rust off of the interior walls of the water heater tank. If your water supply is “soft,” you may need to replace the anode more often than usual, as soft water tends to be more corrosive. These basic fixes can be carried out by almost anyone, but a lot of water heater troubleshooting and repair is best left to the professionals. Water heaters are complicated machines that do an important job; it’s not worth permanently damaging your water heater or your home trying to perform advanced repairs by yourself. In addition, as with any major gas or electrical appliance, improper maintenance procedures carry a significant risk of injury. If you’ve covered the basics and your water heater is still acting up (or not acting at all), then it’s important to reach out to experienced plumbers with the expertise to get your water heater back up and running and get things back to a happy normal in your home. Christianson Air Conditioning and Plumbing has been in the business of giving customers their money’s worth for nearly seventy years and, in that time, we have developed a sterling reputation for excellence in service and unparalleled on-the-job know-how. We work with all types of hot water delivery systems and bring decades of cumulative knowledge to any water heater issues that may arise in your home. Our plumbers are highly trained with extensive experience in the field, with skills equal to any home plumbing repair task thrown their way. We want to make sure that our customers get the most out of their water heater investments, which is why we offer CAMP: the Christianson Annual Maintenance Program. CAMP is a service provided to our clients that includes a series of comprehensive annual inspections to guarantee maximum operational efficiency for your water heating system. Our CAMP inspections include checking for water hardness, proper venting, unnoticed dripping and leaks, burner assembly, and pressure tests, as well as basic water heater draining as described above. We also offer emergency plumbing services because we understand that some problems need fixing sooner rather than later. Don’t let a faulty water heater derail your day-to-day routine. Contact Christianson Air Conditioning & Plumbing today to speak to a qualified service professional about installing, maintaining, or upgrading your hot water delivery system.